IPS - Industrial Parts & Services offers a variety of other products and press repair services including welding, counter balances, electric motors, and press controls. We also offer press repair / rebuild of stamping presses, blanking presses, forging presses, hydraulic presses, and more. Professional press repair puts you back in business fast! IPS offers complete heavy industrial manufacturing equipment maintenance, press repair and refurbishment services for all of your hydraulic press repair, welding, and stamping presses needs. Instead of purchasing costly new machinery and press parts, let IPS examine your existing mechanical press, hydraulic press, stamping equipment, forging equipment, or other manufacturing equipment. 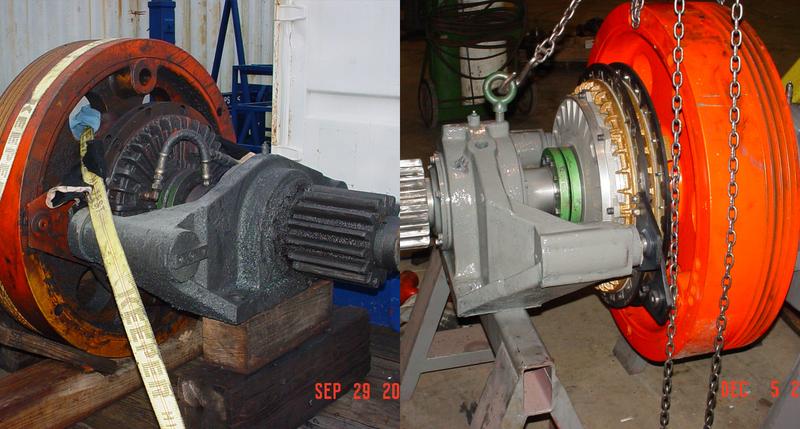 Our experts can provide solutions to justify refurbishing your equipment for a fraction of the cost of new machinery. Contact IPS today for your welding or press repair needs! Emergency breakdown press repair and field services are available anywhere, 24 hours a day/seven days a week. Our field service associates are prepared to solve your mechanical press, electrical and hydraulic press problems on-site on all brands of stamping presses and forging equipment. Broken shafts, worn-out gears or other damaged components will shut down your production and your profits fast. The staff at Industrial Parts & Services, Inc. knows the importance of putting your stamping presses and forging equipment back in service as quickly as possible. In many cases, your components can be repaired at less cost and in less time than obtaining new press parts. Often we perform our work on an emergency basis in our plant or in the customer's plant as needed. This work may entail disassembly, inspection, press repair and assembly work as well as on-site welding and on-site machining work. Industrial Parts & Services, Inc. employs highly experienced and skilled employees to handle all aspects of your press repair. Our machine repairman, machinists and welders are some of the best in the industry. We take our business very seriously and view your success as our own. Our mission is to give you reliable and efficient manufacturing equipment. We stand behind our work 100%. Rebuilt or remanufactured machines can offer like-new quality and productivity at a lower cost than new equipment. Working hand and hand with our technical group, we can help your company decide on which services are needed to meet your manufacturing requirements and goals. Cracks are cut out and then welded or brazed 100%. Welding is a very technical discipline. Successful welding involves proper preparation and preheat, use of the correct welding procedures and a thorough stress relieving for success. We can perform welding press repairs on cast iron, cast steel, or fabricated steel parts on stamping presses, hydraulic presses, and manufacturing equipment.